Have you ever had a blister from a mosquito bite? For most of us, bites have one main annoying side effect: they itch, a lot. For others, mosquito bites can cause a more severe allergic reaction in their body, this includes blisters. Blisters can be painful and hard to deal with, particularly if they’re in a location such as our heel or around the ankle. In this article, we’ll look at what actually causes mosquito bite blisters to form, and how to deal with them. Why Do Some Mosquito Bites Blister? When mosquitoes bite us, they inject a little of their saliva into our bodies. They do this so that our blood does not clot, allowing them to easily feed. Because mosquito saliva is foreign to us, our immune systems rush to the defense, pumping the area we’ve been bitten with histamine. It is this histamine which causes a reaction to a mosquito bite. Most of these bites result in the usual side effects: itching, redness, and a slight swelling. All of these symptoms should go away on their own within a few hours or a few days at the most. But for people with a stronger reaction to mosquito saliva, the resulting symptoms can include nausea, dizziness, and blisters. Scratching the bite may also cause a blister to form, due to a skin infection. Mosquito bite blisters might occur on the bite, or the area around the bite. The reason I say blisters, and not blister, is because they can occur as clusters. You may notice a group of tiny blisters forming around the bite area. These small blisters sometimes combine into one massive blister. Treating the smaller ones as quickly as possible can prevent them from growing. A blister is formed by your body, to protect the area beneath it. Fluid collects in between the outer layer and the inner layer of the skin. This fluid acts as a sort of cushion and barrier to protect the raw skin while it's trying to heal. Fluid inside the blister can be pus, blood, or plasma, depending on the cause of the blister. Blisters, as annoying as they seem, are actually very important when it comes to helping the skin heal. For this reason, it's important that you do not pop blisters, even if they’re the result of an itchy mosquito bite. You should deal with all blisters in the same way: clean them gently and then treat the area with the right ointments or creams. The worst thing we can do if a blister occurs is to pop it. Popping a blister will reveal the new, very raw skin underneath. Exposure of the raw skin is not only painful, but it can also lead to further infections, which will potentially lead to scarring. The first thing you should do if you notice blisters forming is to clean them very gently with soap and water. Be careful though, applying too much pressure might pop them. It's always best to treat mosquito bites with an anti-itch cream, or any other soothing method to prevent yourself from scratching. Cream can minimize the effects of a bite and may even prevent blisters from forming in the first place. If your blisters become very painful, or if they occur after several days of the initial bite, it’s a good idea to get them checked by a doctor. The doctor can advise you on how to treat the blisters best. Some doctors choose to pop blisters and then dress the wound. You might be given a prescription for an antihistamine to help reduce the effects of the bite. Antibiotic creams are also sometimes prescribed to help reduce the risk of further inflammation and bacterial infection. Sometimes, the blisters burst on their own before they should. If this happens, it’s crucial that you don't peel away the skin. Instead, let the blister drain and then wash and clean the area with water and soap. You should apply an antibiotic cream and then cover the wound with a sterile dressing. Covering the blister in a bandage or gauze is an excellent way to keep it safe from further trauma. This is especially important if the blisters are located where your clothes fit tightly, or on your feet, where your shoes might rub. Keeping an eye on your blisters is key to knowing what’s going on with them. In fact, the color of a blister can tell a lot about how serious it is. Clear blisters are regular, healthy blisters. These are typically filled with plasma, a protective fluid. Cells leak the plasma which encourages the healing process. Some blisters can be very dark red or even black. These are full of blood due to damage in the subdermal tissues and the blood vessels. These blisters are usually caused by an injury which didn't break the skin. Another type of blister is the infected one. This blister will be full of pus and will generally have a yellow or green tinge. The area around the blister will be red and swollen. If you do notice this type of blister, it should be checked by a doctor to rule out further infection. The first thing to do is treat the bite as quickly as possible. Apply something cold to reduce the swelling and itchiness, and to prevent yourself from scratching. Next, wash the area thoroughly but gently in order to keep it clean. Since it is scratching which often creates the blisters, it is essential not to scratch. Applying an anti-itch cream after cleaning the bite can help reduce the urge to scratch. Blisters can also occur due to an allergic reaction. Taking an antihistamine after a bite may help to reduce the risk of blistering. 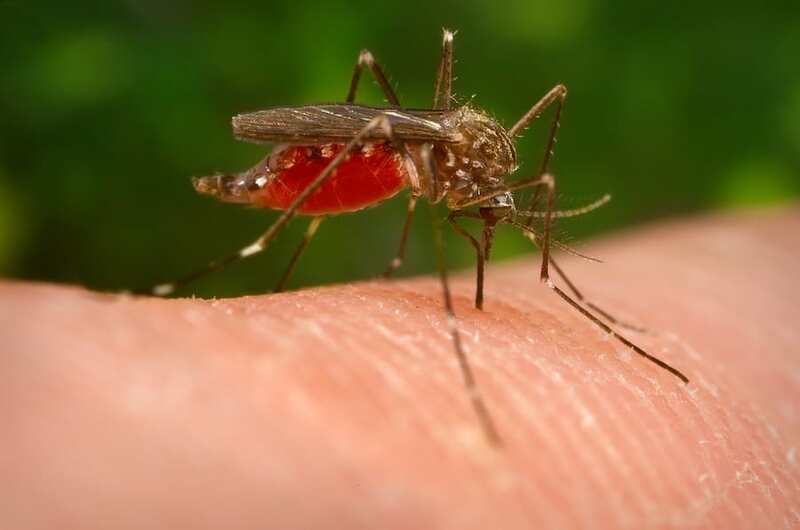 If you’ve previously suffered severe reactions to mosquito bites, you could take antihistamine medication before knowingly exposing yourself to mosquitoes. As always, the best thing to do is to prevent mosquito bites in the first place. It might seem impossible at times, but knowing what works can make a significant difference. Apply a mosquito repellent before going out. Check yourself. Did you cover all your exposed skin in repellent? Double check your feet and ankles and around your hairline and neck. Make sure you're wearing reasonable clothing; long pants and a shirt, maybe even boots. Some mosquitoes are very persistent, especially the Aedes. They are known to find any exposed skin on the body, even biting through clothes. Taking the right precautions is key to avoiding both mosquito bites and a potential blister from a mosquito bite.